We just brought Tater home yesterday. She's 8 weeks old. Our Aussie mix, Brownie, died in May and we miss her so much. 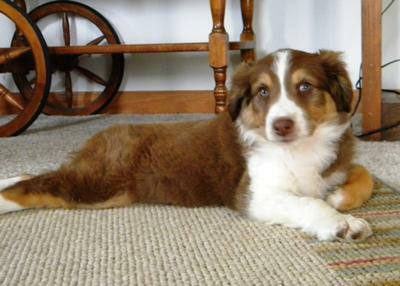 For an outside/inside dog we just had to keep looking for an Aussie, brown preferred. We have 2 indoor hairy kids, a fat Pug and a Yorkie mix who are not impressed AT ALL! The next few months should be fun, training her and getting her used to the big wide world of an acreage with livestock! What a handsome pup! I'd love to get an update photo update and hear how's he's coming along. Iowa got slammed with some early cold weather so Tater isn't getting the quality outside time we hoped but she is answering to her name and boy is she good at fetching. Our fat pug Sheeb is warming up to her. The terrier mix still hating her guts. Time will tell, especially when she grows bigger than BOTH of them!